The Alexander McQueen gown that Kate Hudson wore just took my breath away….she looked like a modern Goddess!!! I just wish that she brushed her hair backward or something so that the embroidery would stand out more! I don’t think that I have ever seen Amy Poehler look this good before!!!. She looked ultra chic and modern in that Stella McCartney suit and her Chopard necklace was just stunning. Julianne Moore won a Golden Globe for her role in Game Change…. I would have given her an award just for wearing that beautiful minimalist, monochrome Tom Ford gown!!! Nope, I am not talking about Will and Kate (though I think that they are a perfect match)….. I am Talking about Kate and Sarah Burton!!!!! The Creative Director of Alexander McQueen just picked up a well-deserved OBE for ‘services to fashion’ in Her Majesty’s Birthday Honour List… I think that it is a well-deserved Honour for many reasons, the most important one of them is that she designed the most beautiful dress that Kate has ever worn!!! That wedding dress (and that dress alone) helped turn Kate Middleton into a style icon!!! 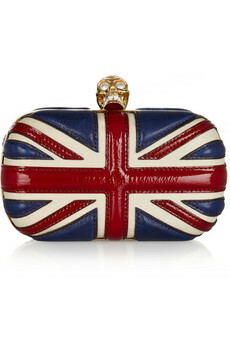 Who knew that Alexander McQueen and The Duchess of Cambridge would create such a winning combination? 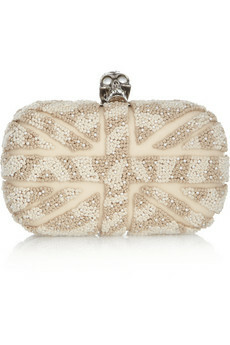 Celebrating The Queen With McQueen!!! 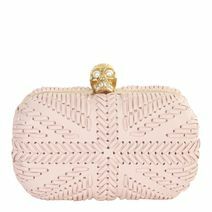 Why not make a fashion statement while paying tribute to Queen Elizabeth’s Diamond Jubilee with one of Alexander McQueen’s iconic ‘Britannia’ box clutches? It’s the ideal statement piece that will sure turn a few heads!!! Cate is one of the most intelligent, most capable and most stylish actresses. Her performances in both the Elisabeth movies and as Bob Dylan were just so impressive… but unlike a lot of actresses she is equally as impressive on the red carpet and I think that that’s because she takes as much risks in fashion as she takes in choosing her roles!…..she always goes for an avant garde look, that is always incredibly stylish and never boring…. Though I don’t see myself in most of her choices I can’t help but wait to see what she’ll wear in events… she never fails to surprise me…. She has a style that only she can carry off…. There is nothing common about her or her style… Nobody owns the red carpet like her! There are so many looks that I love … But I narrowed it down to my favorite 3! She wore this black Alexander Mcqueen gown to the Golden Globes in 2007. It was the perfect example of how to stand out in a black dress! Another Alexander McQueen dress but this one is from the Spring Summer 2009 collection…. It looked so much better on her than it did on the red carpet! I’ve saved the best for last!! !….Cate in this vintage Christian Lacroix Haute Couture…. This is by far my favorite dress on her!